Ed Sheeran is the talk of Westeros following the "Game of Thrones" premiere, but his scene would still be problematic without him. Ed Sheeran’s “Game of Thrones” debut arrived with all the subtlety of a teenager driving 90 miles per hour down an otherwise quiet country road. No, the pop singer wasn’t crooning his hit single during the Season 7 premiere — or “Tiny Dancer,” for that matter — but he was singing. Before Arya Stark (Maisie Williams) even came into focus, Sheeran’s soft English tones could be heard offscreen. “He rode through the streets of the city, down from his hill on high,” Sheeran’s song began, abiding by a popular theme of his music. The group of soldiers joined him on the chorus, but quickly faded out as Arya arrived in their camp. “It’s a new one,” Sheeran said, inducing groans the world over. That Sheeran didn’t turn his gaze directly into the camera and give a Frank Underwood-esque wink was the most shocking aspect of a scene that never really went anywhere. But aside from Sheeran, the scene itself was either a step in a surprising new direction or a frustratingly tame indulgence. A brief segment revisiting a character already introduced in a rabble-rousing cold open, one could argue the scene was meant to showcase the weary warriors; the soldiers who just want to go home after initially craving adventure. Once they found it, they’d had enough. Now, they crave the simple life: out on a boat with their dads or raising daughters with their wives. It’s a stark difference (no pun intended) from precarious moments of “Game of Thrones'” past. 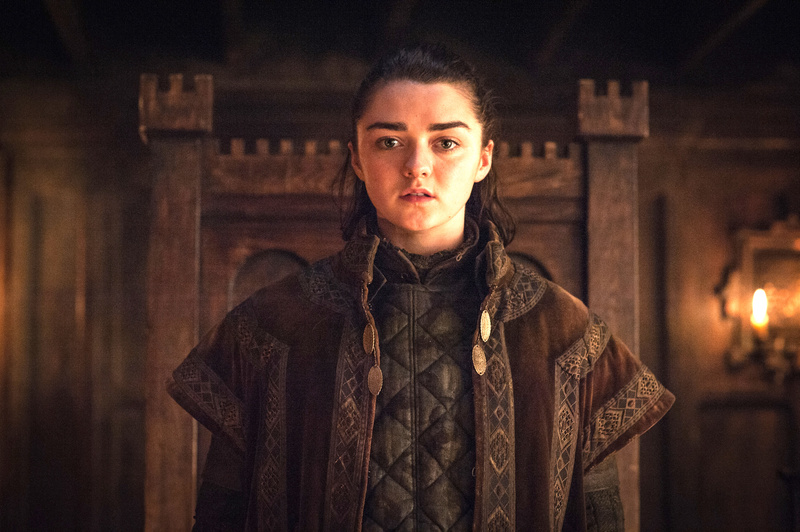 Arya, after all, certainly hasn’t had an easy time out in the world, and stopping to visit a group of all-male soldiers who outnumber her eight-to-one would have likely spelled trouble in past seasons. It felt like it would this year, too. The ominous look Arya got when dismounting her horse and the stolen glances she gave to the men’s swords casually teased a conflict to come. But none did — not this week, anyway. Instead, the scene was a change-up in a series filled with fastballs. “Game of Thrones” is set within a dark world where its characters’ worst tendencies are used to drive the plot. Jamie (Nikolaj Coster-Waldau) shoving Bran (Isaac Hempstead Wright) out a window; the Night’s Watch murdering Jon Snow (Kit Harington); the Red Wedding: There are so many examples where the worst within someone, usually driven by the quest for power, is acted upon in order to keep the game going. Some might say by moving in the opposite direction, the series is growing. Instead of the soldiers attacking Arya or Arya stealing from them, the scene served as a bonding moment between young warriors. Arya has undoubtedly suffered far more than these men, and yet she willingly pushes on — to kill the queen — while they begrudgingly fulfill their duties. To that end, the season premiere offered a number of cheerful, innocent moments. From Samwell’s feces & swill montage to Arya’s cold open killing spree, little was done to provoke anger, pain, or heartbreak. Good times were had by all as plans were set in motion. It was, after all, an episode setting up what’s to come more so than giving us definitive actions in the moment. But from a writing standpoint, there’s still a problem when the scene itself doesn’t amount to anything. Samwell’s entire arc drove toward discovering where Dragonstone is buried in an old book. Arya’s vengeance was sweet, but redundant. And perhaps we’ll revisit these gentlemanly soldiers in future episodes, but the prospect of more Ed Sheeran spouting his graciously short lines isn’t exactly paramount to the series’ success. It might be best if we deem this a busted cameo and move on. Beyond him, though, the scene did little for the episode. As we inch ever closer to the end of “Game of Thrones,” each moment becomes more precious. Each piece carries more meaning. Every episode matters when there are only 12 left, and we hate to see time wasted on a poorly utilized celebrity in a scene with no tension. If there would have been a threat to Arya — or if she would have posed a threat to them — at least the Sheeran cameo would’ve been built around something other than itself. As is, it’s an unforgettable moment for all the wrong reasons: Sheeran disappointed, the scene itself didn’t progress the plot, and the jokes — from Sheeran’s meta opening line to the delayed laughter at the end — were painfully cliched. Unless they resurface later, even the soldiers’ stories about missing their families failed to evoke urgency or development. Everything unexpected about the scene didn’t add up to anything more than, “I can’t wait to go home.” But whether the episode drove the same lane is up to you.